My first meal out after Peru and I go back to South America. Fogo de Chao is one of the more pricey churrascarias in town. For those of you who’ve not been to a Brazilian BBQ restaurant before, it’s the home of the Meat on a Stick! Vegetarians beware. Or be damned! You will probably get some meat juice on your shirt. Or a tiny meat chunk might fly in the corner of your mouth. Sorry, in advance. Like every restaurant on La Cienega (restaurant row) you’ll get that element of chain restaurant cheese. Extremely large space. Lots of tourists. Vegas like atmosphere. We had our firm holiday party here and it was the perfect place for it. The meat ended abruptly, just when my boss grabbed the microphone (to all the other dining guests’ delight) and did his usual end of the year speech. As soon as the gift cards were handed out, I grabbed my jacket and left LA for Big Bear for a little weekend snow. Hey, they didn’t announce any raises or bonuses, no point in sticking around. 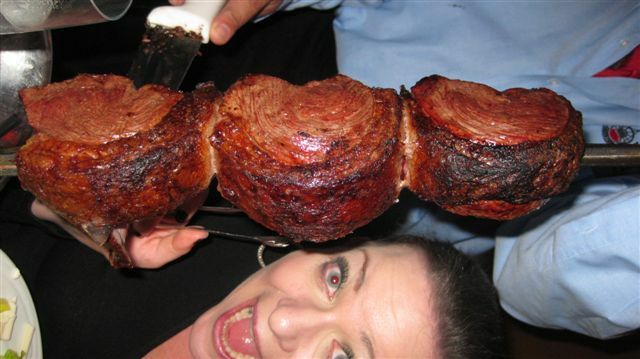 hey–i came across this blog randomly searching for pics from fogo de chao. i wanted to use this photo in my blog–just wanted to make sure it was ok with you. if not, it’s cool.